When we got rid of our old mattress, we got rid of the box springs as well. They were over 15 years old, and it was time for them to go. 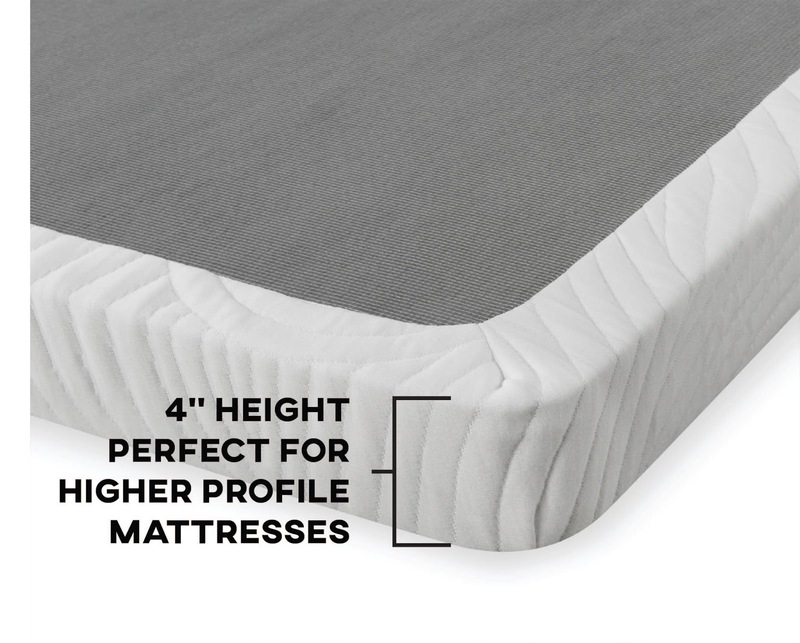 When we did the 75-day trial period of the Saatva Mattress, we used their matching foundation, but now we need something for our Sapira (as it did not come with a matching foundation). With most modern mattresses, our bed-height was a little too low without a foundation or box spring, but a little too high with a traditional 8-10 inch box spring. Enter the Zinus 4-inch Low Profile Bi-Fold BoxSpring! This handy product is one where the title pretty much says it all (except for the "Spring" part -- read on). It's great for when you need just a little more height for your mattress, which makes getting in and out of bed easier. Additionally, I feel that it just makes things look nicer -- a low mattress just looks a bit out of place. We ordered it though Amazon (click here to see it on Amazon), and it was eligible for Prime shipping. This low-profile foundation does exactly what it says it is supposed to do, and does it very well. Our goal was to raise out mattress up about 4-5 inches with ease, little assembly, and no squeaking or sagging. It comes in a fairly large box and is a bit heavy, so an elderly or frail person would likely need help. However, once it is unboxed, there is no assembly needed, just unfold it, flip it over, and zip it up. It would be very easy to take with you in a move. This is not a "Box of Springs" - there are no springs inside. 95% of modern mattresses do not need a true "box spring" anyhow so that's fine. The purpose is just to raise up your mattress. It does not soften the mattress, nor is it designed to. "Foundation" is the better name. 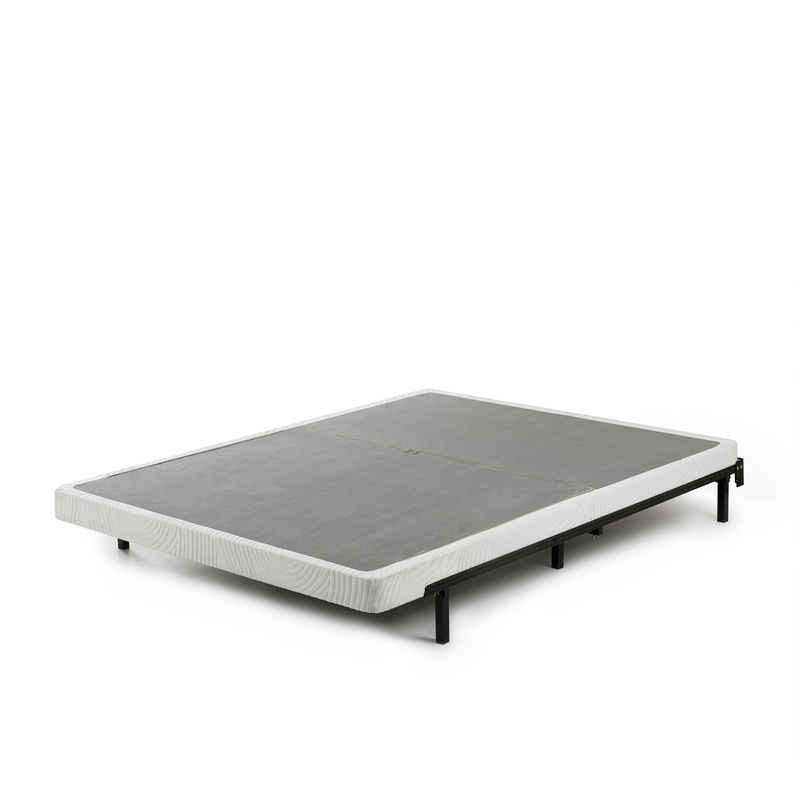 The Zinus 4-inch Low Profile BoxSpring on a basic base. The bars are about 1/4 inch thick, and almost exactly 3 inches apart. The Foundation (as I measured it) was about 4 1/4" high (no big deal for me, but just noteworthy if you need "exactly" 4 inches). I was a bit Leary at first about using this with my Hybrid mattress since I was afraid that (because the bottom is foam) it would sink through. However, I emailed the mattress company and they assured me that this foundation is fine to use (I have a Sapira mattress). Most of the reviews I have read said it's OK for almost any type of mattress, but if in doubt, check with the manufacturer. About 3 1/2 weeks of use so far, it's holding up fine, and the mattress works very well with it. It is very sturdy, no sagging. No noise, no squeaking. The bars have not sunk into the mattress. The sides are a nice patterned white cloth. Nice enough that we have not felt the need to cover it with a sheet like with did with our old one! I would recommend this foundation if 4 inches is the best height for your bed setup. We have a queen and it supports two grown adults just fine. According to the paperwork that came with the Zinus, it has a 5-year limited warranty (though it didn't specify what that covers), The flyer that comes with it also says that it can support up to 2,400 lbs. for the queen size or larger -- which seems a bit ridiculous, but I think the point is that it is very sturdy! So far this is perfect. I will update my post if things change as we use it more and more. Really, I see no drawbacks, so all I can do is wholeheartedly recommend it! Clicking this box does not commit you to buy; it merely shows you the product. Why not place it in your cart and think it over? - Ordering Direct from Zinus, the manufacturer: Click HERE -- there will be a 10% discount that's applied automatically if you follow this link (you won't see the discount until you get to the cart). If you have Amazon Prime, the shipping from Amazon is 2 day, whereas the link from Zinus is about 5-6 days, at least where I live. Prices, discounts, and conditions vary, so click on the links. Since prices change frequently, I suggest looking around and finding what works best for you. The above links are affiliate links; please see the disclosure at the bottom of this web page. Note that I paid full price for all products unless noted otherwise; all opinions are my personal reviews and preferences. Thanks for your consideration. HI, thanks for your video, it's helpful. In the video it looks like you have a solid surface under the Zinus foundation (plywood or particle board maybe?). Is that required under the Zinus? If I were to buy it, mine would simply be resting on the bed frame's side rails and the few intermittent wood cross slats. Thoughts? Thanks! Yes, we do have two large boards on top of our bed frame. That is something I added many years ago (back when we needed a literal box spring -- a box filled with springs). 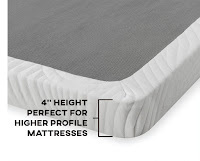 However, MOST modern mattresses don't require a box spring of any kind -- with that said, this product will work just fine as long as you have some cross slats (I would say you would need at least 3 - one near top, one in middle, one near the bottom). As long as you have at least 3 cross slats, it will work fine. If you only had the side rails, it would even work fine then for intermittent use, but I would be afraid it wouldn't hold up over time if it was used every night with no cross supports. If you do buy it, I would appreciate it if you would use one of the links in my article. Thanks!!! Thank you for your review and video. I have an Ethan Allen king sized 4-poster with side and foot rails and am replacing the mattress with a Leesa. This foundation would replace the existing 2 piece box springs There are wooden slats inside the rails. My question is would this two-piece foundation as sturdy as your queen, one-piece foundation? I'm concerned the two pieces would slide. Thoughts? And yes, if I order, will do it from the link you provided! My best guess is yes, it would be fine in your situation. I say this because when you turn the foundation with the proper side down, it is very strong. It is steel reinforced around the edges, and it is listed as being able to hold 2,400 pounds! Having said that, I've not seen your bed set up (of course) so I can't say with 100% certainty. Amazon usually allows a pretty generous return policy. When you order, have them ship the box in another box (like if it were a gift) which will keep the inner box in good shape on the off chance you need to return it. Hi does the box metal box spring not need middle support to the ground ? I think all the weight is just on The sides of the bed but there isn't any contact in the middle of the mattress. Wouldn't that cause the mattress to sag? Or no? My mattress, for example, has a center support already. For Twin or Full size, you're probably OK if your bed doesn't have center support. For Queen or larger, I would not use it unless there is center support. 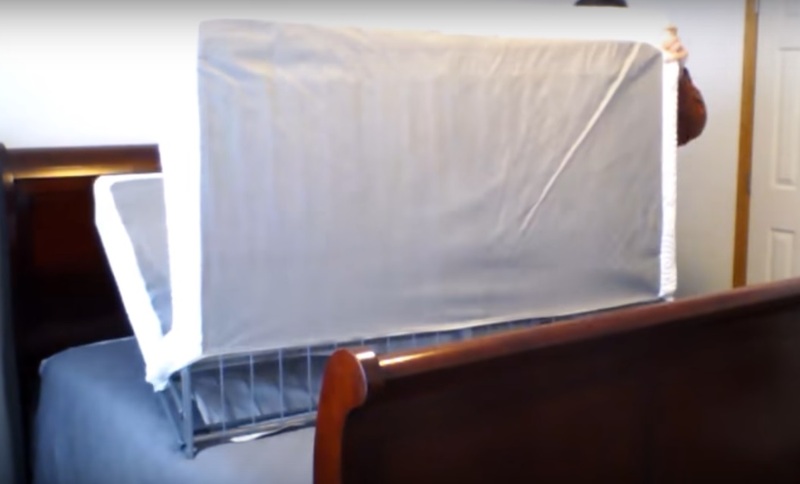 When the box spring is folded, what are those final dimensions (queen)?